I like brownies because, well, they are chocolate. However, I wouldn't say that I love brownies. They have always seemed a bit one dimensional taste wise to me - overwhelmingly chocolate. I prefer my chocolate treats to have extra flavours and textures. That's why I am in love with this Gingerbread Brownie. It is chocolate, it is dense and it has the bonus of having wonderful spices in it. The amount of spice is just right in my opinion. Enough to know it is there and enjoy it but not overpowering. The spices work really well with the chocolate. It makes a really thick batter, so make sure you smooth it well into its tin before baking. 1. Grease and line a square 20cm cake tin. Preheat oven to 160 degrees. 2. Place chocolate and butter in the bowl with the kneading blade. 3. Select Sp 3, 65 degrees, 6 minutes. 4. When programme is complete, scrape down the sides of the bowl. 5. Add remaining ingredients in the order specified. 6. Select Pastry P1 1.30min. When there are 30 seconds remaining, stop the machine and scrape down the sides of the bowl. Resume programme. 7. When the programme is complete, place batter in the prepared cake tin. 8. Bake brownie for 25 - 30 minutes in the middle of the oven. 9. 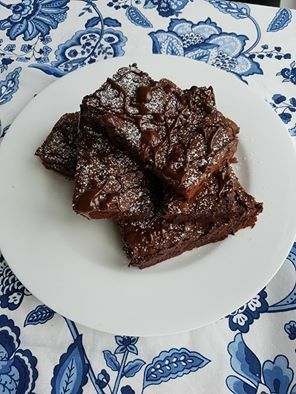 Brownie is cooked when fully set but still soft in the centre. Do not over bake or you will have a dry brownie. 10. Allow to cool in the tin. Then decorate. 1. Place broken up chocolate in the bowl with the kneading blade. 2. Select Sp3, 65 degrees, 5 minutes. 3. Place melted chocolate in a zip lock back and snip off the corner. 4. Sprinkle icing sugar over the brownie and then drizzle chocolate over the top. NOTE - you can do the icing sugar and melted choc before you cut it into squares or after. Whichever takes your fancy.